Halloween is filled with spooky stories, scary costumes and everybody’s favorite, candy! 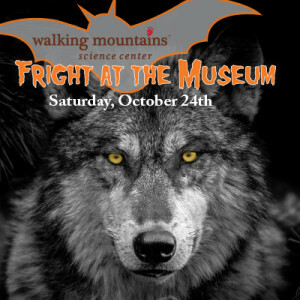 Walking Mountains Science Center is adding their own twist to Halloween at the 3rd Annual Fright at the Museum on Saturday, October 24th from 3:00pm-6:00pm. You and your little ones will discover the spine tingling tales of Halloween and its many Creatures of the Night! As daylight disappears and the darkness falls upon us, explore the world of bats, owls and wolves and their special skills needed to survive. “We’re excited to have the community explore our Science Center in Avon. It’s a great opportunity to celebrate Halloween with family-friendly activities for all ages that incorporate learning into the fun,” said Lara Carlson, Community Programs Director at Walking Mountains Science Center. The main attraction for this year’s event is the opportunity to meet two live wolves! Colorado Wolf Adventures, a wolf sanctuary in Woodland Park that educates the public about the animals, will bring in two live captive wolves. On your way to interact with the Wolves, Walking Mountains’ educators will teach you about wolf ecology, the history of their near extinction, and how the animals appear in our legends and stories. The wolf exhibit will be open from 3:30-5:30pm during the event. “Fright at the Museum will bring mysterious animals out of the shadows and scary movies and shed new light on their true character all while providing fun and learning for the whole family,” said Lara Carlson. Live Wolves – Learn about some of the biology, ecology, and history of wolves in the U.S., along with the stories of how these particular wolves came to live with humans. Look into the eyes of a real wolf, and let their fierce green fire inspire you! Spooky Forest – Can you help Little Red Ridinghood get to her grandmother’s house safely? A favorite children’s story will come to life and test your courage as you encounter creepy sounds and eerie eyes deep within the spooky forest. Night Vision Funhouse – Experiment with “seeing” temperature and explore all the ways that nocturnal animals see in the dark of night! Our funhouse will help you imagine seeing the world as nocturnal animals do! Senses – Test your 5 senses with challenges galore! Come learn about the incredible adaptions that nocturnal animals use to survive in the night. Find out if you have what it takes! Face Painting – What is Halloween without a little face paint? Take some time to have our expert face painter get you in the Halloween state of mind or add some style to the costume you are wearing! Owl Craft – Join us for a fun owl craft! Participants will create an owl decoration as they learn what makes an owl a successful creature of the night! Bat Boxes – Bring on the bats! Bats live in the night and are so beneficial to our ecosystem. Help build bat boxes to be placed in natural habitat to encourage bats to thrive in our area and learn fun facts about these nocturnal creatures. Tickets are $15 per person and children three and under are free. Snacks and beverages will be available for additional purchase. All proceeds from the event will go to support Walking Mountains Science Center programs that awaken a sense of wonder and inspire environmental stewardship and sustainability through natural science education. Fright at the Museum is sponsored by Eagle County Schools, Energy Smart Colorado and the Vail Daily. Cost: $15 per person, children three and under are free. Click here to learn more and purchase your tickets!